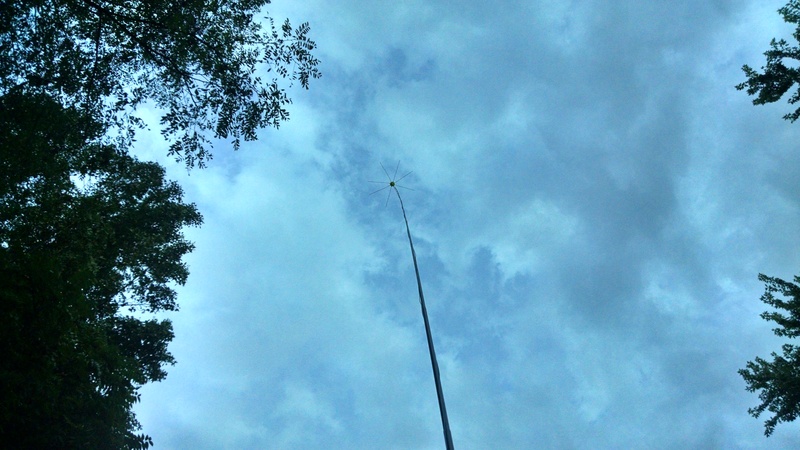 ← Short 40 meter Vertical with Tuned Spiral Counterpoise. Very interesting. I’m firmly convinced that there is no free lunch with antennas, but you seem to have discovered a workable configuration. Good work. In theory it should be possible to scale the antenna size down to work at VHF. That might allow easier experimenting with different radiator lengths and spiral dimensions to more fully understand the design. It would also be interesting to compare your measured results with efficiency predictions from a NEC2 (or NEC4) model. Fortunately, a square spiral such as yours is easy to model in NEC2/4, but I believe there are issues (such as segment alignment) that require careful attention when dealing with closely-spaced parallel wires. 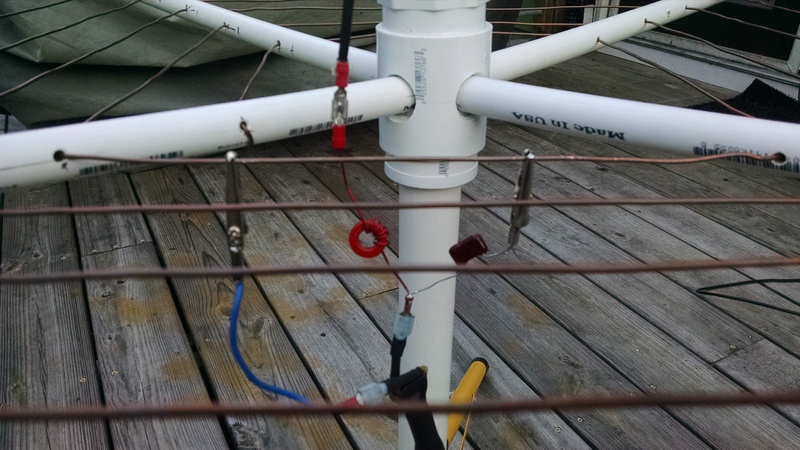 frequently done with VHF/UHF ground plane antennas. Drooping will probably affect the radiation pattern more than Z or efficiency – just a guess. In general, the large spiral I made will out perform a small set of radials (16 or less) 1/4 wave radials on the ground. I say this based on some cursory field strength measurements, impedance and on the air performance. So if you think of the spiral as a decent performing 1/2 of a dipole – then having a full length 1/4 wave radiator for the other 1/2 dipole would be best. If I remember correctly the hamstick is fairly short – which will make your efficiency even less and and make for a pretty lo Z match. You can adjust for this with an swr meter and a movable tap for the spiral. I suspect it would work better than a two hamstick dipole, but if you can get your vertical element as long as possible – as you well know – that would be best. I made lots of contacts with my spirapole and found it to be a great choice for a small footprint vertical topology. I duplicated your spiral counterpoise and made a center loaded vertical to attach to it. 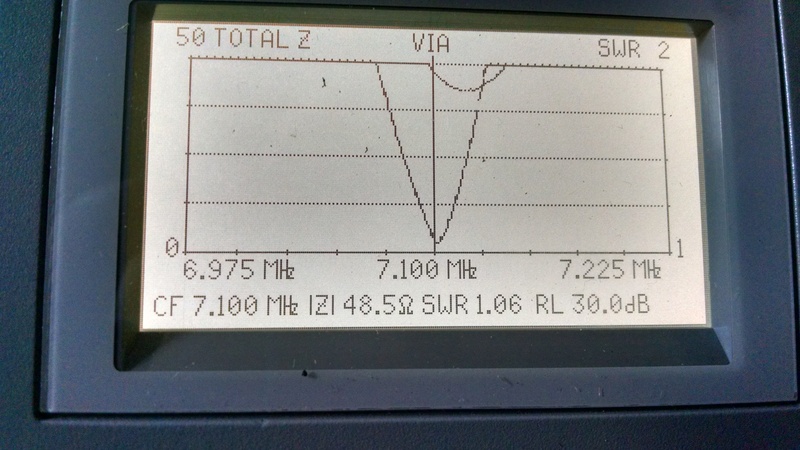 at about 7.125 MHz. Its like you mentioned that moving the tap on the spiral tunes the system. 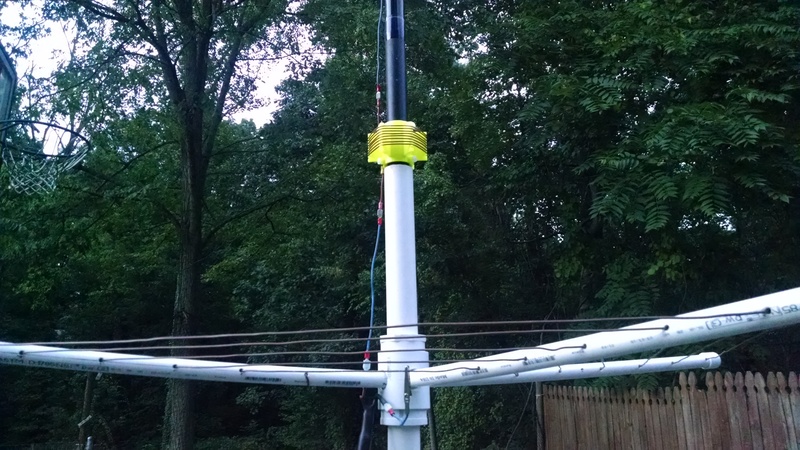 overall height from the top of the counterpoise is 109.5 inches and it occupies a 30 inch square. this allowed me to screw in the bottom radiator. I’ve tried to attach photos to show the set up but don’t know if they came through. didn’t see the photos but very interested in your results..any contacts? That’s a much smaller vertical element so will be interesting to see how it does. Yes its not a backpacking antenna! It really for a small foot print fixed location like a patio, deck or small yard.